There are many common traits and interesting characteristics of the twin soul, as well as some unusual signs and symptoms of the twinflame energy and experience. These signs indicate that one is about to meet their twin flame, or has already been reunited with their twin soul in on a physical level, as well as a description of the dynamics that take place in a twinflame relationship. There may be some unusual circumstances and powerful events that occur around the time when twinflames meet. Many twin souls may have even crossed paths at one time or another in the past, without even realizing it. One or both of the twin souls may have had dreams or visions of the other shortly before meeting, or even years prior to meeting. Some may envision a special person throughout their life that they feel destined to meet one day. The energetic feeling and imagery of this 'mysterious person" can be accompanied by a feeling of familiarity, comfort, excitement or longing. After meeting the twin soul in physical person, these dreams or visions about them that occurred prior to the meeting may suddenly seem to diminish or disapear. This can be a strong indication that the individual is indeed the twin soul. It's as if the non-physical/energetic idea of the twinflame has suddenly been made manifest in on a physical level. When twinflames come together there may be a sense of familiarity between them. They can feel as if they have met one another before, or like they are 'continuing' where they left off in the past. Since twinflames are always spirtually connected, the feeling of having known each other all their lives can be strong. The connection between twin souls is often instananeous and a deep friendship bond or a relationship can develop quicky between them. There will usually be several signs, synchronicities, or 'meaningful symbolic coincidences' that lead up to the meeting of the twinflame, often guiding them both to one another initially and onward in the relationship. Synchronicities will occur throughout the twinflame connection, becoming more frequent during periods of heightened spiritual growth or when energetic shifts occur within the union. A common sign of a twinflame soul connection involves the numbers 11 and 33 and other dual and triple synchronicities popping up repeatedly. Seeing 11:11 or 3:33 appearing on clocks at 'just the right time' (or when thinking about the twin) happens frequently around the intital reunion and during key moments throughout the relationship. There is often a peculiar synchronicity involving the birthdate of one or both twins, such as the birthday of one twin being the same or very close to the birth date of a family member, or even a previous soulmate. There can be many other interesting synchronistic connections between other important personal dates or numbers within each twins life. There are often cosmic and astrological events that occur around the time of the twinflame reunion and at major points during the connection. When comparing the birth/natal charts of the twin souls some interesting correspondences and powerful aspects can usually be found. This union is truly 'written in the stars'. Once twinflames have met or are connected in this life, there is often physical distance between them, or long periods of physical separation that occur. Twin souls may live far apart, or even reside in different continents of the world. Unique conditions can often prevent the twinflames from being together in physical person; oftentimes. There may also be something that prevents a romantic relationship between them from forming, or that makes a romantic relationship difficult to maintain. Twinflame souls will feel a very strong and deep connection to one another early on. The bond is often instantaneous, although sometimes it can occur gradually over time. Either way, there is no doubt that there is a powerful and unique energetic connection between them that sometimes can't be explained in words. When twinflames finally unite with one another, both of them will experience an acceleration of their spiritual growth and personal awakening. The intense energy of one's twinflame can feel magnetic, exciting and comforting. Home is where the heart is, and hugging one's twinsoul can feel like a homecoming. The voice or laughter of one's twinflame can trigger a familiar feeling of remembrance. And since eyes are the windows to the soul, gazing into the eyes of one's twin can trigger a powerful feeling of soul recognition. An interesting sign of the twinflame is that some twin souls might resemble each other in some way, or even share one or more distinct physical attributes. Previous relationships and soulmate connections may have helped prepare one for the twinflame. Sometimes, one's twin may even have or embody a number of similar characteristics or attributes of previous partners, either positive or negative. Twinflames tend to have unusual common interests or might even share a mutual habit, quirk, or unusual hobby together. They often share an interest in spiritual and metaphysical subjects to some degree. Twinflames often share the same personal vision for the future, and may have a strong interest in personal and/or spiritual development. Twinflames can often relate to having experienced similar life events around the same time in their individual pasts, regardless of their personal backgrounds. Sometimes each twin soul may have the same emotional issues or karmic energies that need to be healed together, balanced within their own lives, or resolved with people close to them. The twinflames will often experience life tests and trials at similar times before and after meeting as their souls reflect each other's lessons. When twinflames are apart they often find themselves text messaging or calling each other around the same time. There may be other uncanny similarities in each twins day, such as discovering that they have had the same type of meal on the same day, or even the same dreams on the same nights. Twin souls can often have the most deeply profound and heartfelt conversations that can even last for hours at a time. The heightened energy between twinflames can spark the most creative and imaginative ideas between them and can be just as intense if there is any arguing or disagreement about anything. Telepathy and psychic empathy can occur between twinflames. A twin soul can sometimes sense what the other is feeling, thinking, or doing. The longer twinflames are connected and the deeper the bond, the more in-tune they will be to one another. Twinflames may experience the physical and intimate aspect of the connection in a very powerful and dynamic way. Even if twinflames are separated by distance, they can experience each other on an energetic or etheric level. In a romantic twinflame union, the physical attraction and physical passion can be strong. The love making can be extremely intense, especially if they are more spiritually awakened and focused on the heart level. Sometimes one or both twins will experience the 'dark night of the soul' either prior to meeting, during their connection, or immediately following. The dark night of the soul is a profound period of deep inner spiritual growth and soul reflection that can be accompanied by emotional pain, mental confusion and even physical loneliness. The dark night of the soul acts as a type of spiritual initiation, or re-birth' and can usually bring about a profound shift in consciousness, soul growth and transformation. One's life is usually changed in a profound way after meeting the twinflame. Romantic twinflame relationships can be especially dramatic. One is never quite the same after meeting their twin soul because it may be unlike any other connection they've had prior in their lifetime. A twinflame connection can transform one from the inside out, or even lead to a total breakdown of their life as they have known it prior to that point. Often one or both twin souls can be natural empaths and are sensitive to spiritual energy. One's psychic abilities often manifest for the first time or become more enhanced after meeting the twin soul. Twinflames can also develop the ability to heal each other on an energetic level. Twinflames can each bring out the light and dark within each other. They can bring out old unresolved issues or unhealed wounds out from within each other, as well as push each other's emotional buttons like no other can. Being aware of this twinflame dynamic can feel like one is coming face to face with one's self, for better or for worse. One is usually able to completely be themselves when they are connected to their twin. Trust, acceptance and forgiveness are also qualities that come easily in a twinflame union (especially as they evolve spiritually and connect on deeper levels). There can be problems in these areas in a twinflame relationship if there are any negative issues that need to be balanced in the union or healed within the self. When there is harmony between the twin flame souls, it can feel wonderful. When there is unconditional love and any momentum of positive energy between twinsouls, it can feel like Heaven on Earth. But when there is disharmony between the twin flame souls, it can feel intensely painful. 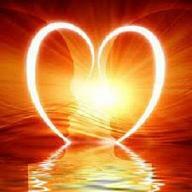 When there is conditional love or any momentum of negative energy between twinsouls, it can feel like Hell on Earth. Even at a distance, twin souls are often able to sense one another vibrationally. They can pick up on the emotional mood of the other and often know what state of mind their twin is in at certain times. Twinsouls can sometimes sense when the other is ill or injured, sometimes even physically feeling the same symptoms in their own body. Twinflame souls can bring out the very best and the very worst in one another. When the twinsouls are getting along in harmony, it can accelerate positive energy and growth. But when the twinflame souls are not getting along, or when there is constant disharmony, it can have devastating effects. Twinflame souls can act as energetic mirrors to one another. If one is in a romantic relationship with the twinflame, then separation can seem painful at times. Sometimes when a twinflame relationship ends, or when both twins mutually wish to part ways, a powerful and magnetic force can seem to draw them right back together again, (especially if there is more soul growth meant to occur). In twinflame relationships that are in the process of healing and balancing, it can seem like an energetic dance between them as they move back and forth away and towards each other time and time again. For some, it can be difficult to let go of a romantic twinflame relationship, even if it is for the highest good of the union to do so. "Letting go" is often a recurring theme and lesson for the twin souls. 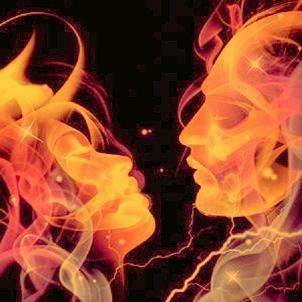 Twinflames are always connected with one another energetically/vibrationally in the heart and on a soul level; this is true even if they are physically separated, or have not yet met one another in person in this life. The union/re-union of the twinflames will take place in Divine Timing when the soul is ready for the experience. Twin flame soulmates will often share similar important beliefs and positive morals and values deep down, even if not apparent on the surface of the personality (sometimes due to issues with ego). There is an energetic polarization between twinflame souls that can be opposite, yet complimentary as a whole. Balance is often a recurring lesson and theme for the twinflame souls. A common indication of a twinflame connection is that both souls may have a strong interest in helping others or serving humanity in some profound way. It's very common for them to resonate with similar or identical social causes and humanitarian issues the world. Twinflames may also experience memories of past lives together or have visions of their mission together on the planet. Twinflame souls will each embody their own unique traits, interests, passions and talents that will help them to fulfill their soul mission on earth, either apart or a shared purpose they may have together as a couple. Twinflames may each have characteristics and aspects of their personality (as well as interests and talents) that can be opposite yet complementary to one another. The twinflame dynamic (especially if it is a romantic relationship) can be overwhelming and confusing at times. The intense highs and lows that can accompany twinflame connections can often make one feel as if they are going crazy. The relationship sometimes doesn't make sense to other people, and even to the twin souls themselves. The dynamic energy of the twinflame is very unique to each and everyone who experiences it. Each twin soul experiences the union in their own personal and special way. At times, aspects of the twinflame experience can seem so unusual that it defies words or logic. Often a sure sign of the reunion is that one will just know deep down inside that this is the twinflame. Trusting one's own intuition and inner guidance is essential during any soul connection. The twinflame connection may not make complete sense on a mental level, but can be 'sensed' through the awareness of the heart.